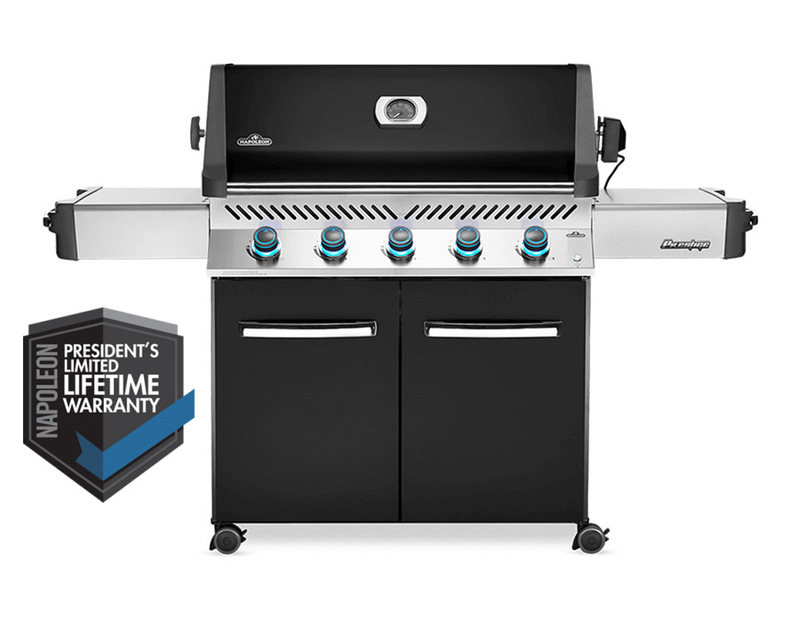 Barbecuing for a large crowd is a breeze with the Napoleon Prestige® 665 Propane Gas Grill, featuring a black porcelain enameled body and stainless steel side shelves. You'll know it's a Napoleon with the iconic WAVE™ cooking grids delivering those distinctive sear marks. Not just durable on the outside; under the lid, quality stainless steel is used for the cooking grids, tube burners, sear plates, and basin. The dual-layered, LIFT EASE™ roll top lid provides superior heat retention, allowing you to sear, bake, roast, smoke, and even turn your grill into a charcoal BBQ with the optional Cast Iron Charcoal Tray. Never leave your barbecue on again as all the Prestige® series grills come with the SafetyGlow Feature where the control knobs glow red when the burner is on. Complete your outdoor living space with a distinctive gas grill that can do it all.